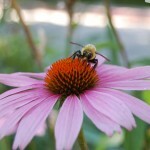 A resource to help save the honey bees and our environment! Pictures of bees. Please submit your photos via e-mail to have them added to the site! The Italian government banned the use of several neonicotinoid pesticides that are blamed for the deaths of millions of honeybees. The Ministero del Lavoro della Salute e delle Politiche Sociali issued an immediate suspension of the seed treatment products clothianidin, imidacloprid, fipronil and thiamethoxam used in rapeseed oil, sunflowers and sweetcorn. 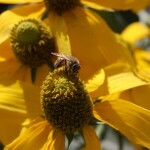 The Italian government will start a monitoring program to further investigate the reasons of recent bee deaths. Italy followed Germany and Slovenia which banned sales of clothianidin and imidacloprid in May. In France imidacloprid has been banned on sunflowers already since 1999. In 2003 the substance was also banned as a sweetcorn treatment. Bayer´s application for clothianidin was rejected by French authorities. The two substances are produced by the German company Bayer CropScience and generated €800 million in 2007. Imidacloprid is Bayer´s best-selling pesticide. In August the German Coalition against Bayer Dangers brought a charge against Werner Wenning, chairman of the Bayer Board of Management, for marketing dangerous pesticides and thereby accepting the mass death of bees all over the world. The charge was introduced in cooperation with German beekeepers who lost thousands of hives after poisoning by the pesticide clothianidin in May this year. Harro Schultze, attorney of the Coalition against Bayer Dangers said: “The Public Prosecutor needs to clarify which efforts Bayer undertook to prevent a ban of imidacloprid and clothianidin in Germany after sales of both substances were stopped in France. We´re suspecting that Bayer submitted flawed studies to play down the risks of pesticide residues in treated plants”. Neonicotinoid pesticides are systemic chemicals that work their way through the plant and attack the nervous system of any insect it comes into contact with. 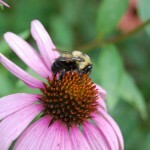 The substances also get into the pollen and the nectar and can damage beneficial insects such as bees. Pesticides made by Bayer CropScience have been banned in a third European country after the chemicals were linked to bee deaths. Italy this week followed Germany and Slovenia in banning sales of chemicals used to coat crop seeds, including clothianidin and imidecloprid, according to a statement by the Italian health ministry and the German consumer watchdog group, Coalition Against Bayer Dangers. Both pesticides are made and sold by Bayer CropScience, a German company that has its U.S. headquarters in Research Triangle Park. 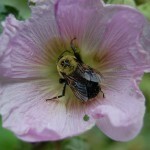 Special thanks to Howard & Susan A. from Eureka Springs, Arkansas for their great bee pictures that follow a great theme "From the bee's point of view"